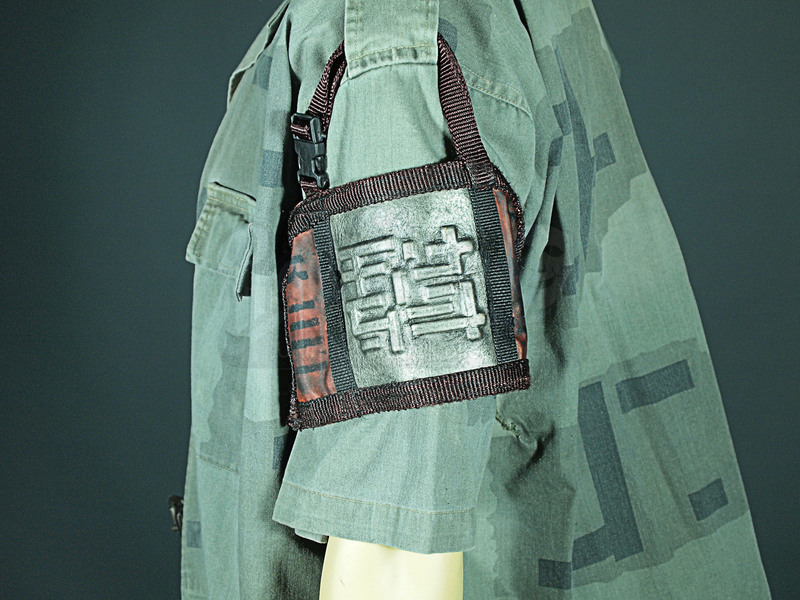 A slam guard costume worn by the guard Kyznetsov (Mark Acheson) in the production of the electrifying Vin Diesel sequel The Chronicles of Riddick. Riddick (Vin Diesel), hidden for five years after the events of the movie Pitch Black, is forced to come out of hiding to fight the villainous Necromongers, and fulfil a dark prophecy in the process. 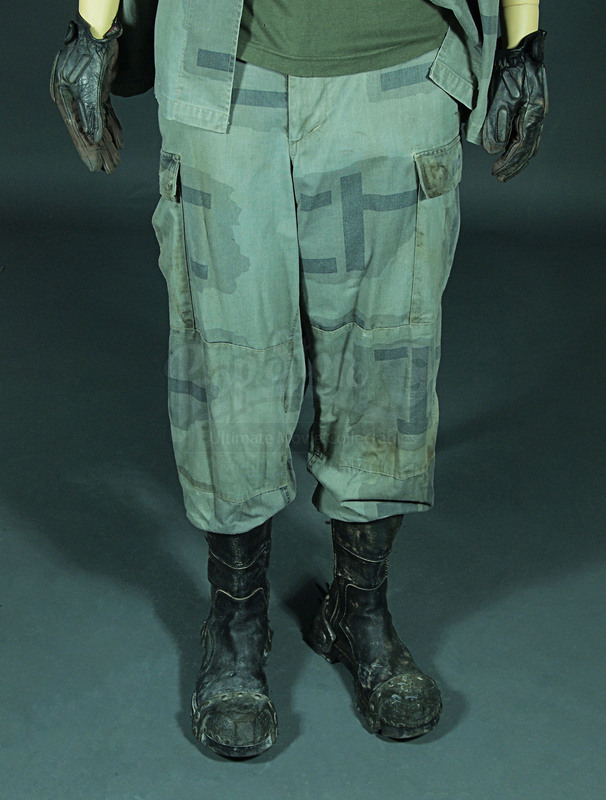 This costume can be seen being worn by Kyznetsov within the slam on the prison planet of Crematoria, where the Mercs take Riddick to claim a hefty ransom. 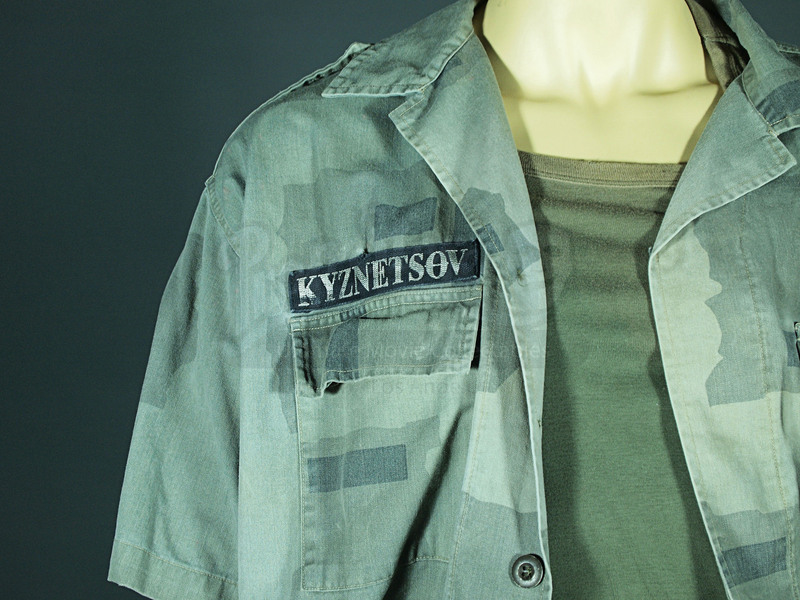 The costume is composed of a custom-made urban camouflage uniform with a black belt and name patch reading “Kyznetsov” (marked “Slam G #5 Mark” in the trousers), a green Gap t-shirt (marked “Slam #4), a leather belt, a red slam guard brassard made of reflective nylon material, a pair of black fingerless tactical gloves and a pair of boots with added heel spikes and toe plates (marked “Slam Guard #5 Mark”). 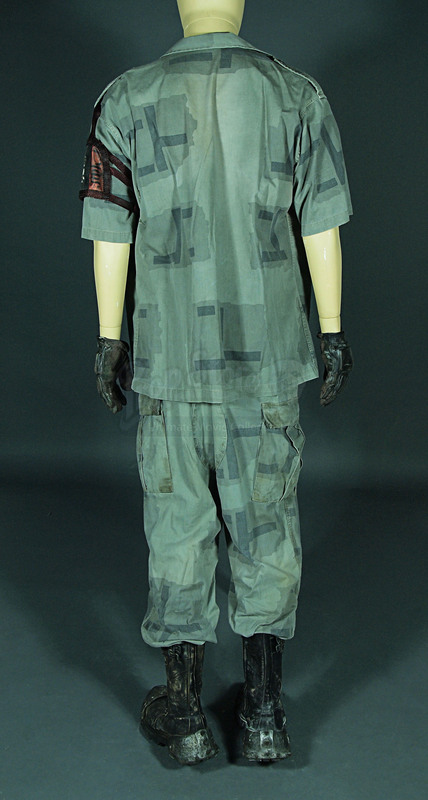 The costume comes with an original costumers tag that reads “Guard #5 Stunt (Justin)”, indicating the costume may have also been used for stunt use. 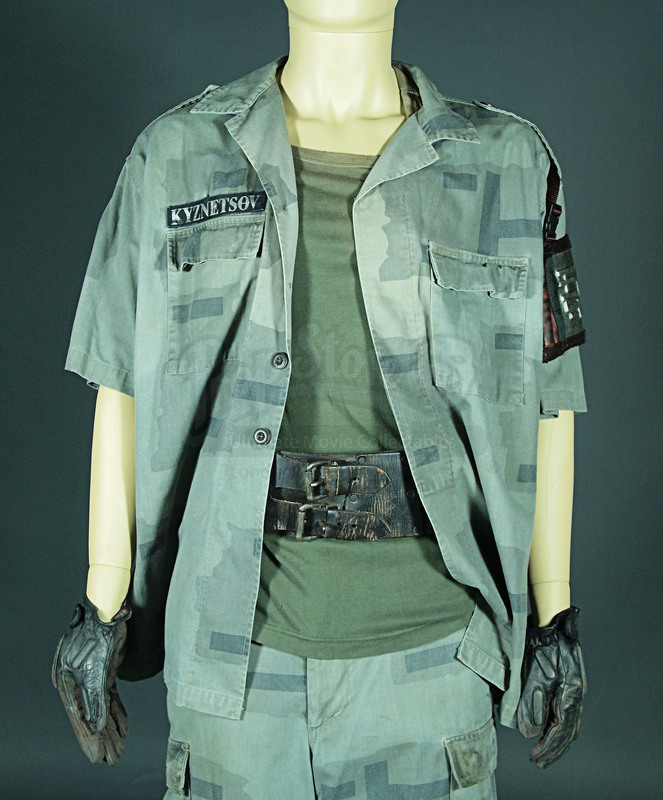 Intentionally distressed for use on the production, the costume features some wear and grime from the Crematoria slam but otherwise remains in a very good production-used condition. 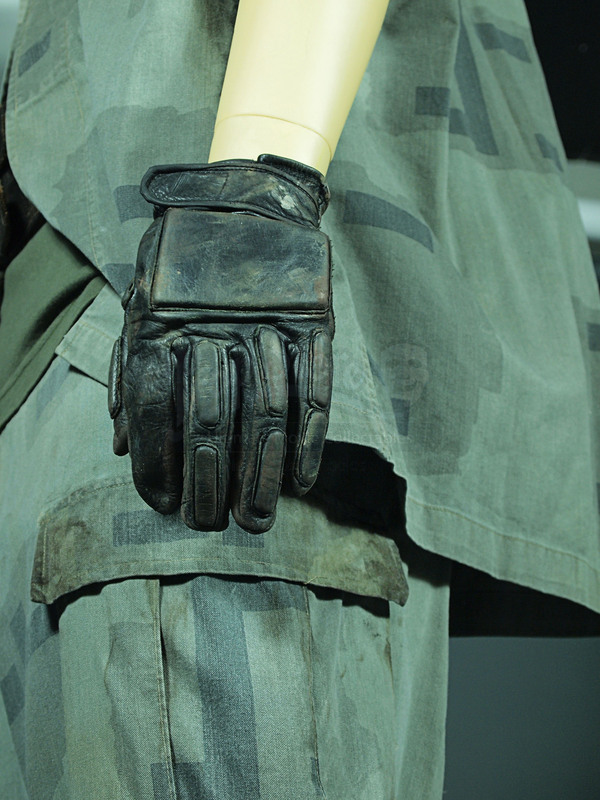 The camouflage shirt is marked as a size “M”, t-shirt is a size “XL”, the gloves a size “L” and the boots are marked as a size “43”, with no other sizes marked.